Summary: As a contribution to the lively debate that has been recently spawned among scholars about leadership preparation embedded in doctoral studies, this chapter explores the relationship between the current conception of the quality practitioner of educational leadership and the usefulness of learning how to conduct action research. The first section describes the quality practitioner and shows how various theories lend themselves to this concept. Building on the theoretical underpinnings for the very practical work of educational leadership, the second section offers a brief discussion of the background and development of action research. In the third section, we consider the appropriateness and relevance of educational leaders undertaking action research projects as the capstone of their doctoral studies. We explore the arguments for the Ed.D. as a more appropriate doctoral degree for the quality practitioner insofar as the Ed.D. is a professional doctorate unlike its research counterpart. And finally, the last section explores a way to weave action research throughout an innovative Ed.D. program so that students of educational leadership experience the application of action research methods to change some aspect of their own organizations as they learn how theory inter-relates with practice. This model is most suitable for part-time doctoral students who have remained employed in some leadership capacity. This module has been peer-reviewed, accepted, and sanctioned by the National Council of the Professors of Educational Administration (NCPEA) as a scholarly contribution to the knowledge base in educational administration. Previously linked to as: http://ccdl.libraries.claremont.edu/u?/irw,317. Pdf created from website version. http://cnx.org/content/col10427/latest/ access to full text of book. This work is licensed by Margaret Grogan, Joe Donaldson, and Juanita Simmons under a Creative Commons Attribution License (CC-BY 2.0), and is an Open Educational Resource. Grogan, Margaret, Joe Donaldson, and Juanita Simmons. 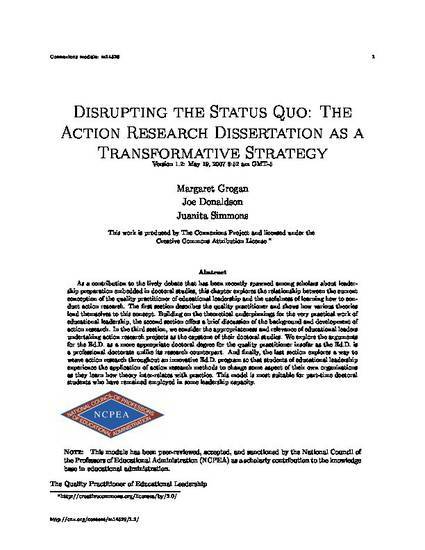 Disrupting the Status Quo: The Action Research Dissertation as a Transformative Strategy. Connexions. 19 May 2007.